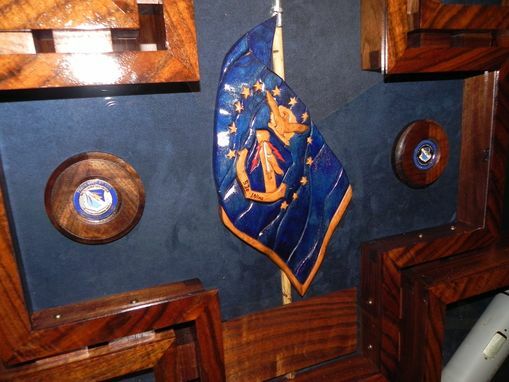 The General's Guidon was one of the most intricate pieces I've built in recent memory. 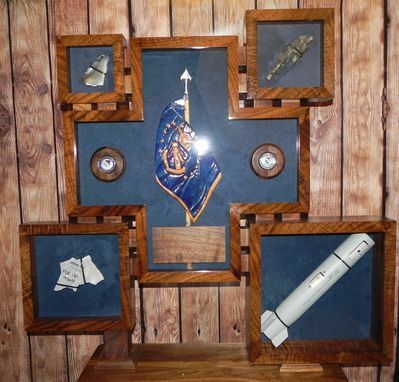 I was asked by some friends to build a going-away gift for our outgoing commander, tossed around some ideas, and settled on a multi-section shadow box that contained a carved model of the Wing's guidon (flag), along with four bits of memorabilia from our various organizations (decoy, bomb fragments, blown up airplane). 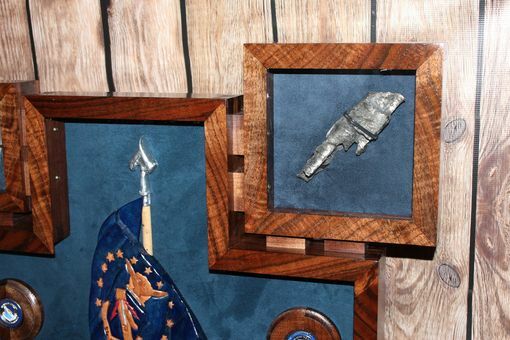 Every section was built from black walnut and used variably spaced dovetails on each corner for strength, since the unit would need to be shipped across the country. The four smaller boxes increase in size and are all different depths to accommodate their contents, requiring individual settings on the dovetailing jig. Once each box was constructed, I added mitered face frames to the front using highly figured walnut strips. The flag was scrollsawn from cherry, then shaped and dyed to match the actual article. 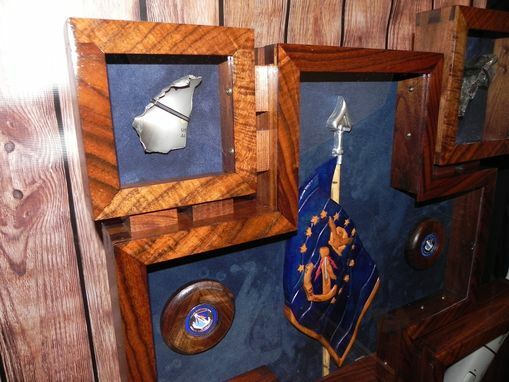 Also on the inside are coins from the Wing's Commander and Chief Master Sergeant, both of which are mounted on wooden discs that were turned on a lathe and individually sized to fit. Small stands were added to let it be set on a mantle and the back of each box is lined with blue suede fabric. Once construction was complete, it was finished with medium walnut stain and oil polyurethane.